It's often debated when exactly wrist watches were introduced. Ladies versions were available 100+ years ago and for the better part of the first quarter of the last century, wrist watches were considered feminine. 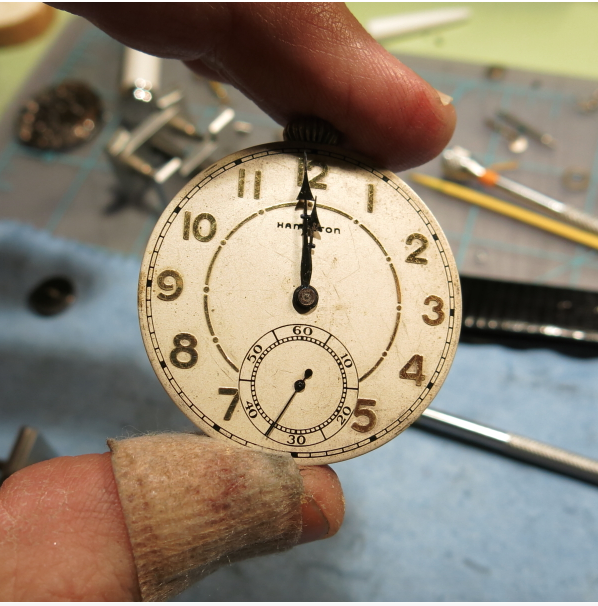 It wasn't until the trenches of WWII that soldiers found wrist watches to be more convenient than pocket watches and had jewelers convert pocket watches to use a strap. 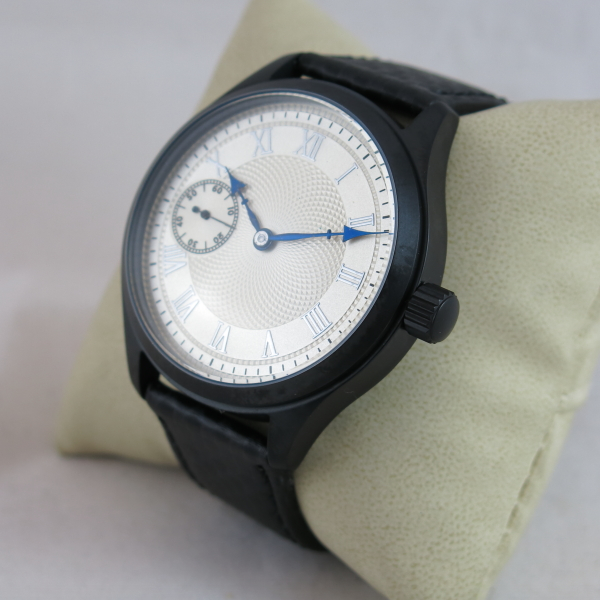 These types of watches are called "trench watches". Of course, pocket watches can be rather large. So it was really the ladies movements that were installed in wrist watch cases originally. For Hamilton, this meant the 0-size movements - several of which were engraved "Lady Hamilton". Wrist watches today are much larger than they were in 1918 so larger movements can be used to create a conversion wrist watch today. 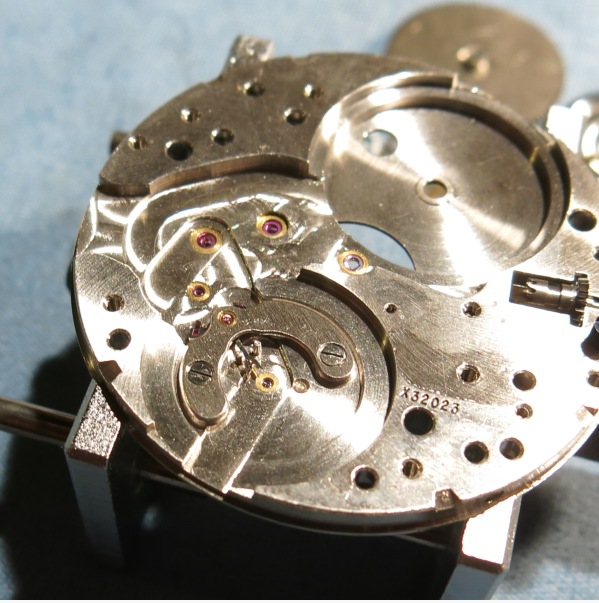 I showed this before on another post, with a 10-size, 23 jewel 945 movement. 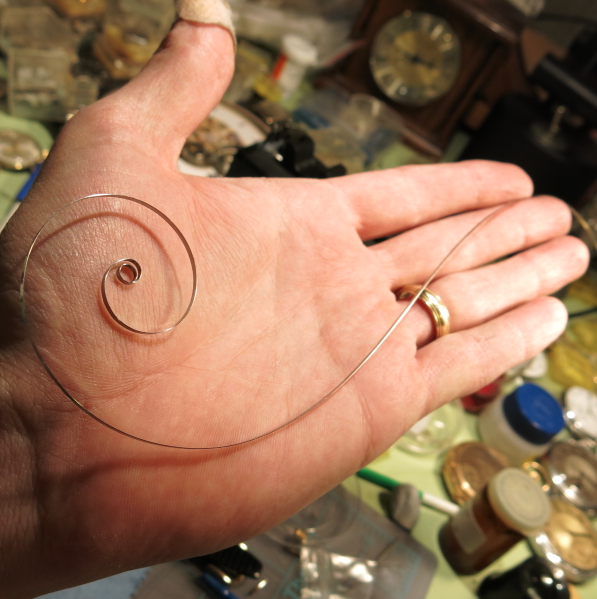 That one turned out great - so I wanted to do it again with a different version and I used a 17 jewel 917 movement. 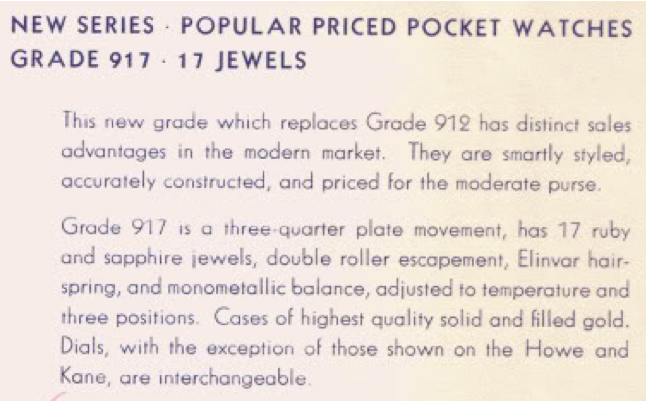 The 917 grade was introduced in 1935 and was the replacement for the prior 12 size entry level pocket watch, the 912. There were a number of improvements introduced with the 917, including the Elinvar hairspring and a monometallic balance. The 917 was produced for 20 year - that's longer than any wrist watch movement. 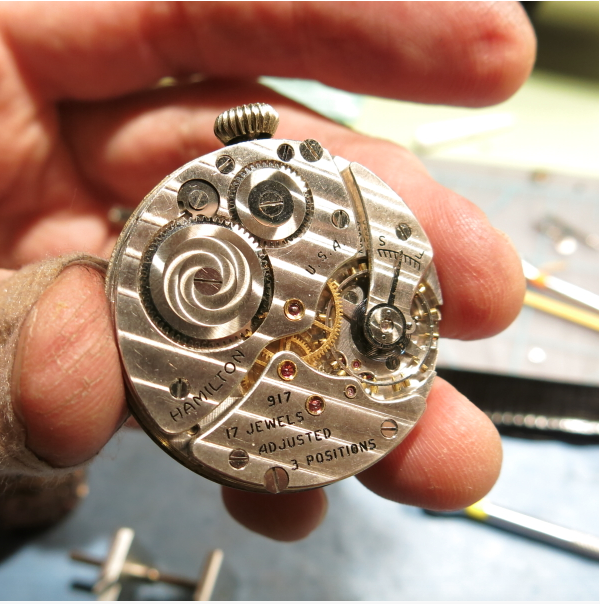 Like wrist watches, the same movement was used in a variety of named models. Some were gold, some gold-filled. Dials were often interchangeable among models so the consumer to customize their purchase slightly. One of the big differences between the 917 and the 912 is the 917 is "positive set" - that means the stem is retained in the watch and when you pull it out the crown to set the time it overcomes the internal springs that keep the watch normally in the winding position. The earlier 912 is "negative set" and works differently. In a negative set movement you push the crown in against the springs that hold the watch naturally in the time setting position. 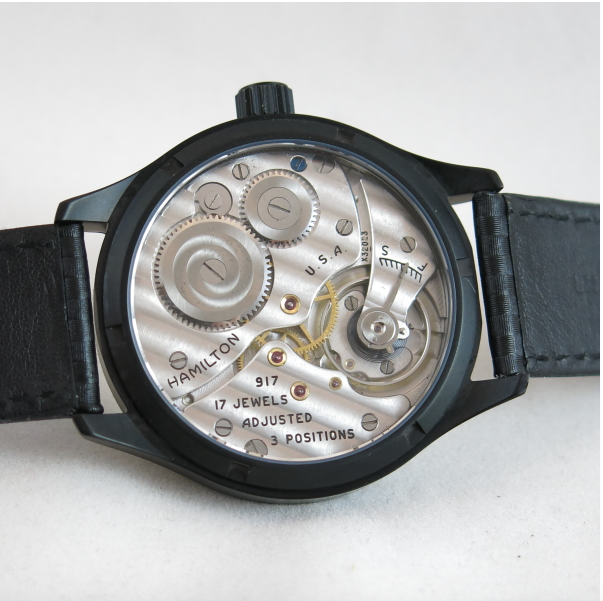 In a negative set movement, the stem is held in the winding position by the stem sleeve in the watch case. Without a stem sleeve, the movement would push the crown out to the time setting position. 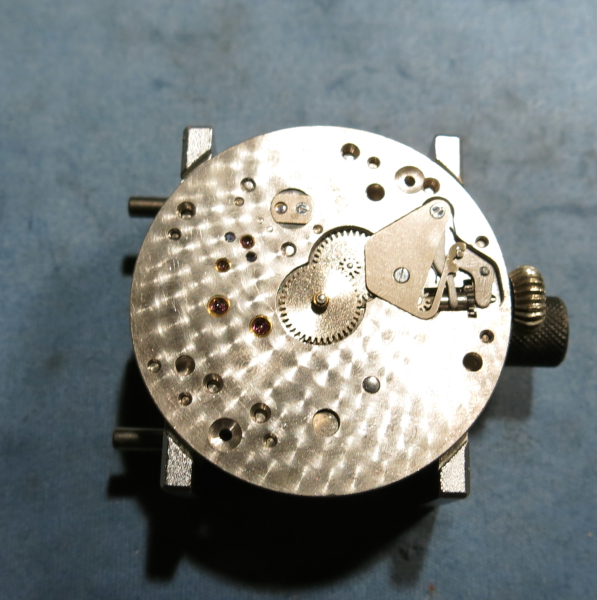 Anyway, for my project watch I purchased a loose 917 movement that came without a case. But it did come with a nice set of blued spear hands that I knew I could reuse. The 917 looks a lot like the 987A's "big brother". Looking at the back of a 917, I bet it inspired the 987A that was introduced in 1937. There are some differences - like the train bridge on a 917 holds three wheels - but, to me, a 917 is basically a giant 987A. The serial number of this watch is X32023 - which dates to 1937. It's also a palindrome - the numbers are the same forwards and backwards - which is also interesting. 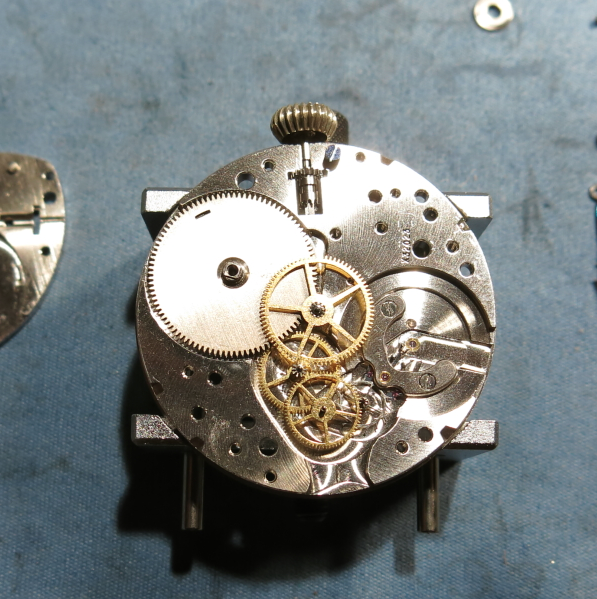 Two dial feet screws on opposite sides of the movement need to be loosened so that dial can be removed. On the dial-side of the main plate, the similarities to the 987A continue. I'll take the hour wheel and cannon pinion off so I'll be able to remove the center wheel later. 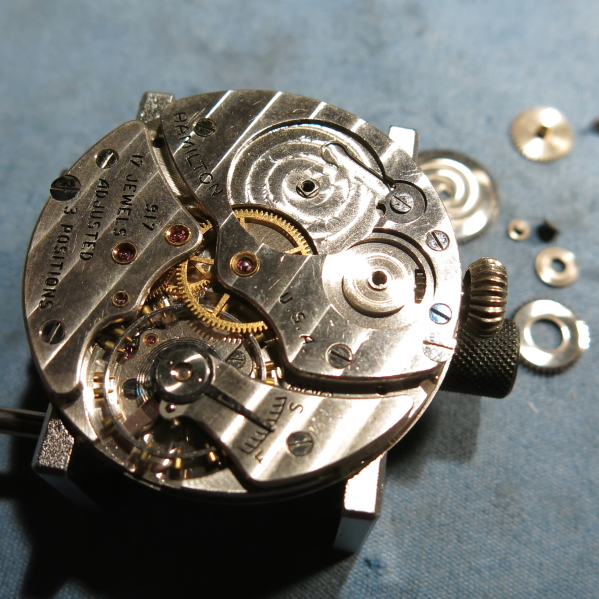 With the mainspring let out, I'll start the disassembly of the back by pulling the ratchet and winding wheels. The ratchet wheel is the smaller of the two. It's screw is reverse threaded so you need to turn it right to loosen it - or opposite the normal direction you turn screws to loosen them. Then the three screws holding the barrel bridge can be removed and the barrel bridge comes off to reveal the mainspring barrel and center wheel. Next off is the train bridge and now all the wheels are exposed and can be safely removed. The balance assembly comes of next. With the balance assembly out of the way, the pallet fork is the only thing remaining on this side of the movement. Two screws will free the bridge and it can come out. 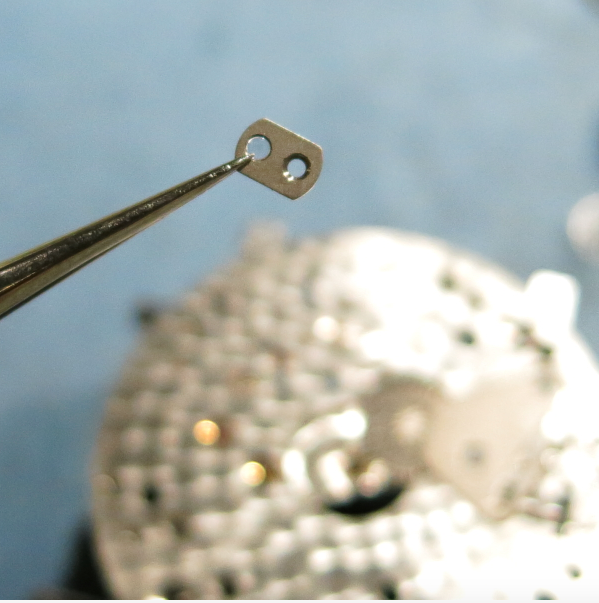 The various cap jewels are removed to ensure the balance jewels get cleaned. There are only two cap jewels in this movement - one on each side of the balance. 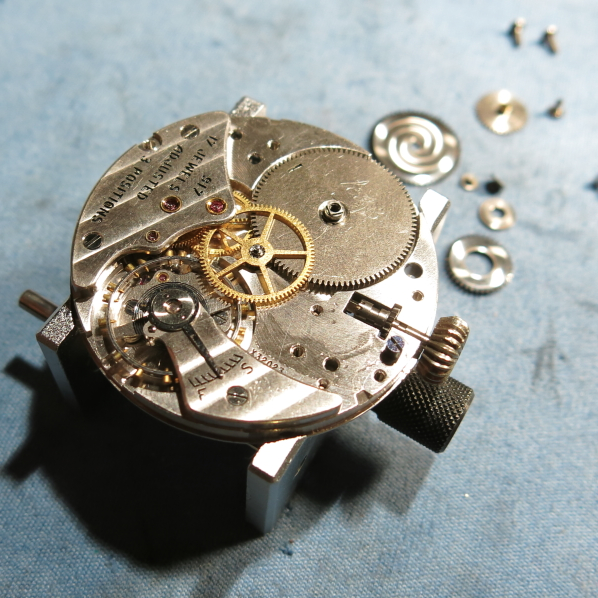 While everything is being cleaned, I'll turn my attention to replacing the mainspring. 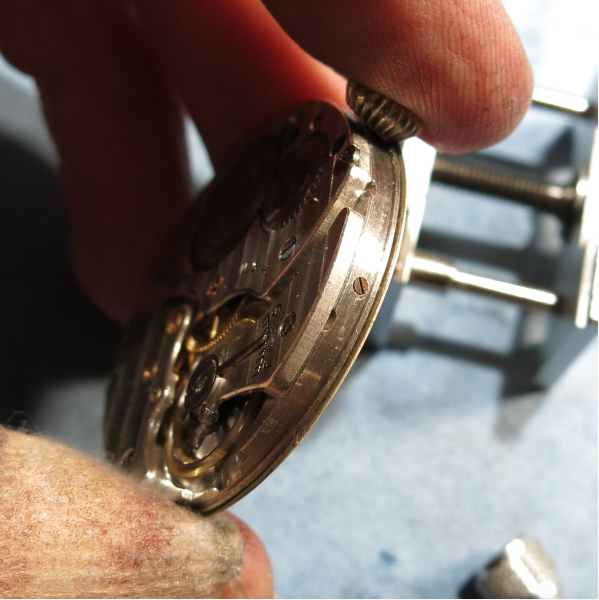 Pocket watch mainsprings can really pack a wallop so you have to be careful when installing them. Everything gets cleaned, oiled and put back in it's proper place. 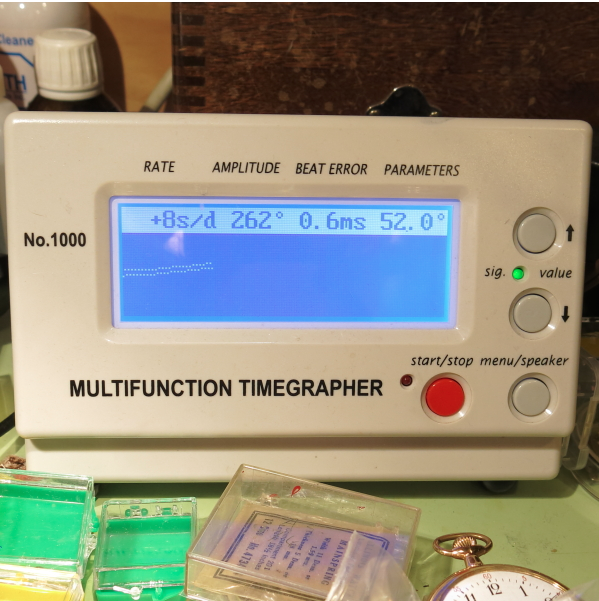 And with a little tweaking to the regulator, the now running movement is running very well with good amplitude, a low beat error and just a few seconds fast per day. 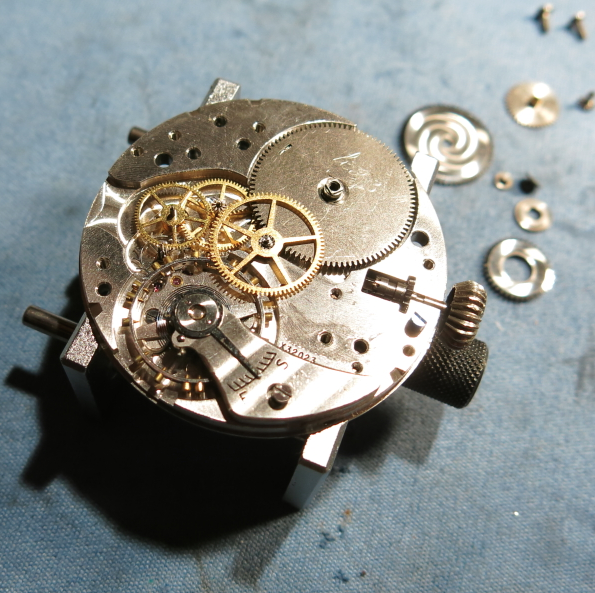 For this conversion I decided to install the movement in a PVD case. PVD stands for Physical Vapor Deposition and it's a coating that adds a very fine layer of black to the base stainless steel case. Unlike paint or enamel, PVD won't flake off. It's pretty tough but can be scratched or even polished through. 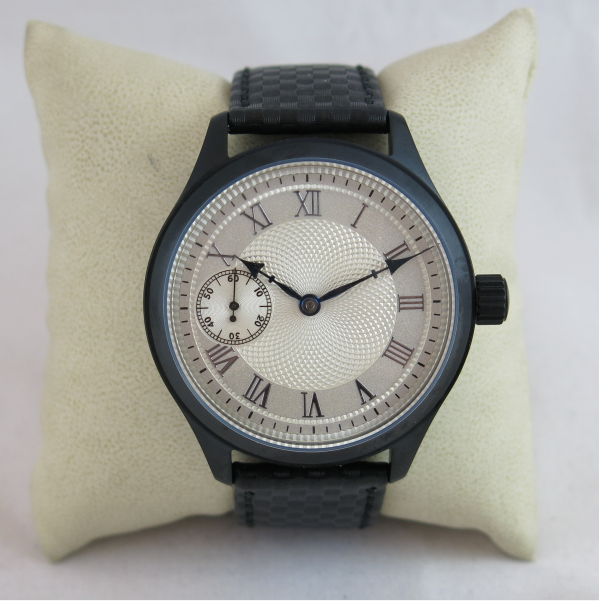 Paired with a woven carbon fiber strap and with the blued spade hands, this a really sharp looking watch. The case features gaskets around the screw-down crown as well as under the screw down display back. I love the display back. It's great to be able to see the movement happily ticking away 5 times per second. 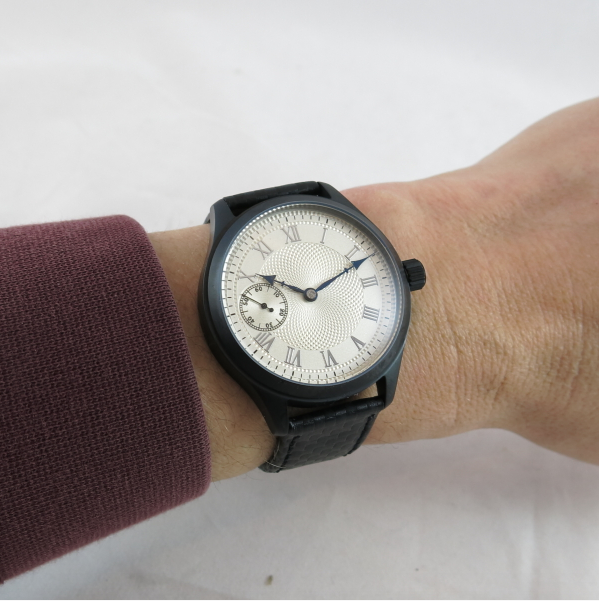 At 45mm wide, this watch has a significant wrist presence. It's still smaller than some of the glamor watches you see people wear today. To me, this is a large watch but not so large that I feel like I have a tuna can on my wrist. This is really cool! Do you sell any of your projects? Do you make your own dials? I have been wanting to do this with a 940 movement. I finally got the movement, but the person on ebay selling cases for this, has disappeared. Do you know of a source for cases? I would think a 940-based wrist watch would be crazy big. I don't know of any cases for watches that large. The parts I needed to outfit this watch came from a seller in Hong Kong. The quality was good. I've also seen materials from Germany - the quality looks very nice but they're super expensive and I've never given them a try. How many BPH was the movement when you set up on your timeagrapher machine , I have one that I just finished and my machine won't automatically find BPH ? Do you recall the rough cost of the case and dial? Only ones I find are the German ones, and I'm not ready to shell out that kind of cash! Did you source the case from Helenarou? Yes, plus stem and dial too.